Old Europe Cheese’s Smoked Gouda: Four Generations of French Heritage Now in the States! The plaque mounted inside the Statue of Liberty—a gift to the U.S. from France—says “Give me your tired, your poor, your huddled masses yearning to breathe free.” It doesn’t say “Give me your cheesemakers” but, thankfully, some French cheesemakers have immigrated to the States and this month we bring you a wonderful smoked Gouda from one of the best of them. Francois Capt, a fourth generation cheesemaker, degreed and schooled in France, moved to the U.S. in 1988 to establish Old Europe Cheese in Benton Harbor, Michigan for its Spanish parent company, Reny Picot. By then he had worked in his family’s cheesemaking business in Normandy, France and run multiple cheese plants throughout the world. Not surprisingly, his teenage son works in his Michigan plant during summers, so now artisan cheesemaking spans five generations. They chose southwest Michigan because of its terroir, to borrow a phrase from winemakers. The word refers to special characteristics of geography, geology and climate that contribute to the unique qualities of a crop . In the case of cheesemaking, it’s the grasses upon which the cows graze that impart unique flavors to their milk. 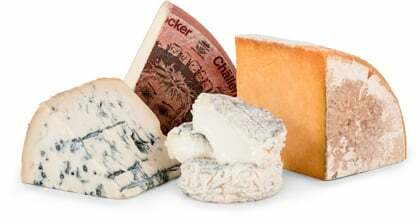 To get great wine you have to have the best grapes; likewise, making great cheese requires the best milk. 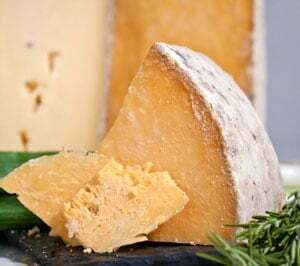 Most cheese manufactured in the U.S. uses Class 3 milk— deemed suitable for cheesemaking but not drinking. Your smoked Gouda is made with Class 1 milk from one of 45 dairy farms in a southwest Michigan co-op. Class 1 milk is fresher. It has to be picked up at the farm more quickly and has to be chilled faster. Needless to say it’s more expensive than Class 2 or 3 milk. All the farms are inspected regularly, not just for consumer health and safety but to make sure the cows are well treated. Originally a Dutch cheese, versions of Gouda are now made by artisan cheesemakers throughout the world, like Michigan’s Old Europe Cheese. Old Europe’s Smoked Gouda is aged 60 days prior to smoking. It’s also unique in another respect and, if you have had other smoked Goudas, we think you’ll taste the difference: It’s smoked using a “cold smoke” process. A fire is lit and burns voraciously until the smoke house is filled with smoke, at which time the fire is allowed to go out. Then wheels of Gouda are placed in the house and “cold smoked” for over 16 hours. Most smoked cheeses makers use a hot smoke—produced by an ongoing fire—which means the cheese is, in effect, cooked twice. That causes the cheese to crack and dry out and the flavor that results is more of a beef jerky than a cheese flavor. The subtle Gouda flavor of your Old Europe Cheese Smoked Gouda will still predominate. Smoked Gouda is a bit nuttier tasting than the regular Gouda. Containing 45% butterfat, it’s buttery, creamy and smooth with sweet and salty notes. As with all cheeses, be sure to enjoy it at room temperature and it will literally melt on your tongue.